Colombia has seen a drop in the murder of human rights defenders and community leaders compared to last year, but a recent report by a Colombian NGO indicated that death threats are on the rise. A report released this week by “Somos Defensores” detailed the crimes committed against civil society leaders in the first six months of 2014, calling it an “important pulse” of the country’s suffering from the civil war. The number of assassinations against community leaders has dropped 18% from the same period in 2013; however, death threats have increased 20%. The NGO points out the concern that, of the 30 homicide cases against community leaders, 18 of the victims had reported threats against their lives. The NGO asserts that “had these warnings been properly attended to, they could’ve been protected and their deaths avoided.” Some of the community leaders had even been given bulletproof vests and cellphones by Colombia’s National Protection Unit (UNP). The report goes on to question the effectiveness of UNP and ask if their methods truly work, even more relevant after the death of a Colombian journalist last week and a former mayoral candidate and activist on Tuesday. Thirty human rights defenders have been killed in Colombia between January and June. Jhon Braulio Saigama and Berlain Saigama – Indigenous leaders tortured and murdered for working to prevent the recruitment of child soldiers by armed groups. They were allegedly murdered by neo-paramilitaries in Valle del Cauca. Giovany Leiton – Community leader in Choco tortured and murdered along with his wife by unknown men. He led protests against illicit crop eradication and denounced alleged abuses by army units operating in the region. Ever Luis Marin – SINALTRACEBA (Bavaria Beer Company Union) leader shot six times by supposed neo-paramilitaries in Atlantico. Miguel Segundo Diaz – Shot two times in the head and twice in the leg. He was the president of the Junta de Accion Comunal (Colombia’s first line of democracy in rural countryside). Carlos Enrique Ruiz – Shot six times in Bogota hours after a pamphlet circulated by neo-paramiltary groups warned of “social cleansing.” Ruiz was an artist part of a cultural collective. 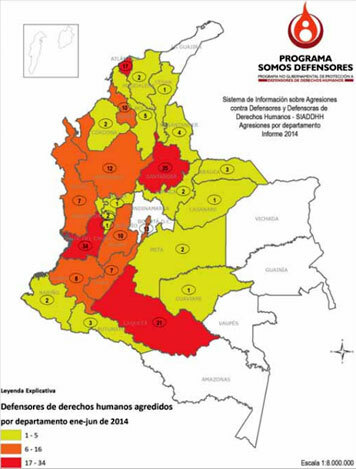 According to the Somos Defensores Information System of Aggressions against Human Right Defenders (SIADDHH), the first six months of 2014 have registered 194 victims of some sort of aggression or threat. The first six months of 2013 registered 154, indicating a 20% drop. Of the 194 victims, 37 are women and 157 are men. In all of the 30 cases of homicide, the victims were men, and of the five crimes committed by guerrilla groups, two were homicides.